Once you have your basic caving gear and SRT kit you may decide to enhance your gear. The following gear suggestions describe gear for different situations up to and including SAR. Gear can be categorised as personal gear, group gear, and cave gear. Personal gear is that which each person brings, and keeps on them between uses. 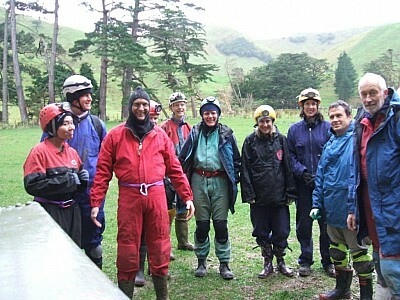 Group gear is per group, typically where several groups go into the cave and rig it, eg for rescues. Cave gear is that required for the cave, eg for specific pitches for commuting. The intention is that only the minimum required amount of gear is taken into a cave. This gear should be chosen with care, and the shovel it in or I'll just add an extra piece approach being avoided. In use the prusik is clipped to your harness, or load bearing waist strap, and the cord clipped into protection. By using the prusik the cord can be extended as required to provide a point of connection when working in an exposed area.